Jeff Reznicek is rebuilding a nationally respected cattle business with lessons learned from his mentor, teacher–and uncle. Jeff Reznicek earned his degree from Southern Illinois University in Carbondale and was settling down in Edwardsville, Ill., 100 miles to the northwest of the college town, not too far from St. Louis. He was remodeling the home he bought there and beginning a career as a professional surveyor. At about the same time, Joe Reznicek, Jeff’s uncle, was thinking about the future. Joe and his wife, Joy, owned Cow Creek Ranch, just outside Aliceville, Ala. After 23 years building Cow Creek into the largest registered Brangus and Ultrablack (a Brangus and Angus cross) seedstock operation in the nation, Joe was eager to find a family successor who, under his guiding hand, would carry the name and the business into the future. Joe’s son, Matt, was a natural choice. But he was making his own career in finance and had little desire to return to Aliceville. Joe and Joy knew it would be difficult to bring most anyone into this small community, its better days long gone. "I’ve a good mind to call Jeff Reznicek," Joe told his wife one day, out of the blue. "He’s a great lover of the land. He’s a good hunter, and he understands nature," Joe said, recalling Jeff’s summertime visits when he worked the cattle and showed an interest in everything about ranching and the local ecology. Find someone with a solid ethic for the land, and he would teach that person the cattle business, Joe believed. Jeff seemed a good fit. He had grown up on his grandfather’s homestead near Hettick, Ill., a 500-acre corn and soybean farm, with a small herd of cattle. Jeff particularly enjoyed working with the cattle. He had even given some thought to using his surveying income to purchase cattle of his own. "Cattle have been on my mind since I was young," Jeff says. "And my dad [August] exposed me to nature at an early age. He taught me to respect the land and how to be a sportsman." Joe made the call in the spring of 2008. Would Jeff be willing to move to Alabama to work on Joe’s Cow Creek Ranch? He offered Jeff 25% ownership in the Cow Creek operating arm after 10 years. It was a fairly amazing offer, Jeff recalls. The 2,350 acres of Cow Creek Ranch sit down in the Tombigbee River bottoms in the Black Belt of Alabama, a strip of counties running west to east through the central part of the state, and more broadly, from Texas to Virginia. This region has historically been home to "the richest soil and the poorest people," Arthur Raper wrote in his 1936 study of the rural South, Preface to Peasantry. In the 1800s, the region’s black soils supported a network of cotton plantations. By the 1950s and 1960s, the region would give birth to the Civil Rights Movement. Aliceville is a long way from Illinois. But Jeff soon packed his belongings and made his way south through Memphis, into the small southern town and to his new home. Jeff drove up the lane to Cow Creek Ranch and its rolling pastures just 30 days before its prestigious 350-head bull sale and 600-head, commercial bred-heifer sale. His work ethic soon made an impression. "Growing up in the Midwest, he was used to work," Joy recalls. "[Jeff] had a sense of urgency to get things done. That is just in your DNA and critical to success in our business," she adds. Forty-five days into the freshly minted business arrangement, the ranch sustained a mighty blow. Joe was diagnosed with T-cell lymphoma cancer. "I never knew Joe to be sick," Jeff says. "He was a big, strong man." The energy-sapping disease all but erased Joe’s ability to manage the ranch. "Jeff was thrown into deep water," Joy says. "He was forced to run the ranching operation practically on his own while we were managing Joe’s disease. Then, his mentor, teacher and uncle was gone." Joe died in January 2010, only 14 months after he was diagnosed with cancer. There was no time for mourning. Responsibility for the ranch and its cattle herd immediately fell to Jeff and his Aunt Joy. Jeff could have headed home–and Joy says she would have understood. He stayed. "I think I surprised my Aunt Joy," Jeff says. "She thought maybe I would pack up and leave. But I sat down in her office and told her that we would make this work; Cow Creek was my home." The composition of the ranch changed quickly. The prized cow herd was sold, and the search was on for income to sustain the ranch. Jeff recalls lessons he learned from Joe. "He was a visionary in this industry," he says. "He took a group of cattle and made them different than anybody else. He pushed his cattle. He culled them hard. He made the cattle work for him." 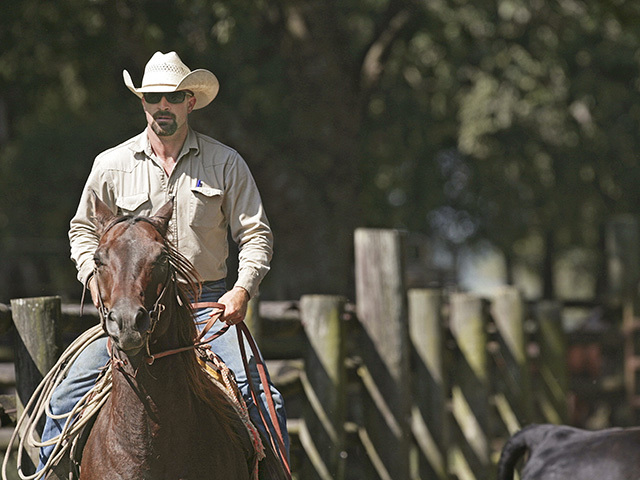 Joe had taught his nephew about the ranch, even as he battled the cancer. Joe showed Jeff every acre, showed him how to interpret what he saw in the pastures and soils as they crisscrossed the operation. The rich soil and the grass, Joe often reminded Jeff, is everything. Jeff learned Joe’s lessons about the soil well. Joe had managed the land with large pastures. Jeff came to believe smaller units would better sustain the operation. He broke large pastures in half, dividing them with permanent fencing. He no-till drilled winter annuals–ryegrass, wheat and triticale–and installed temporary, solar-powered electric fences to maximize winter grazing. Joe gave Jeff the keys to good pasture management. Joe’s directives– Check the pastures. Take mental notes. Consider what the cows ate and where they ate. Don’t graze the pasture down to the dirt. Rotate the herd through it. The new grazing program produced results. The ranch’s stocking rate has grown by 50 cow/calf units, as it rebuilds toward 1,000 cows. In 2011, the newly organized Reznicek Ranch, LLC, ran 90 of its cows on grass year round without hay or supplements. Jeff wants to get 60% of the herd through winter without feeding hay. Even in the ranch river bottoms, water is a carefully husbanded resource. The ranch has seven naturally flowing artesian wells. An eighth well was dug a decade ago. But alarm bells rang when one well stopped flowing for a time several summers back. Jeff and Joy decided the ranch’s cattle water resource needed to be expanded. They joined with the Natural Resources Conservation Service and its Environmental Quality Incentives Program to install a new watering system that includes a solar-powered pump and 6,000-gallon storage tank. Water moves by gravity from the tank to three concrete troughs. The new water supply drastically improves what had been remote and underutilized pasture. REZNICEK RANCH CATTLE. The ranch owns 170 commercial and registered Brangus cows. Most of the heifers are retained for replacements. The ranch is a bull production partner for premier Brangus breeder, Town Creek Farm. Developed bulls are marketed at the annual Town Creek bull sale. INTERNATIONAL GENETIC MARKETING. In partnership with Town Creek, Reznicek Ranch collects and markets embryos to South American and Australian cattlemen. ON-SITE MANAGEMENT. Reznicek Ranch manages and maintains 450 registered Angus and Brangus cows for cattlemen on a cost-per-head basis. CATTLE CONSULTING. The ranch offers management and consulting services, including breeding, cattle management, herd health and marketing expertise. REGISTERED QUARTER HORSES. Jeff discovered a healthy market for working cow horses. Jeff trains young prospects produced from mares bred to some of the nation’s top cutting horse stallions. COMMERCIAL DEER HUNTING. The ranch offers whitetail deer hunts on a limited basis each year in December and January. Jeff has withstood tall challenges at a young age. What began as an opportunity of a lifetime took an unexpected turn with Joe’s death. But Jeff’s reputation as a cattleman and a self-trained, accomplished horseman only grows. "Jeff seemingly walked out of a past generation," Joy says. "His perseverance, values and hard work ethic rival that of my 89-year-old father. Yet, his vision is a generation ahead." Alabama is home. It was not a difficult choice, Jeff says. "I was at Cow Creek for two weeks, and I knew this was what I wanted to do and that this was my future."